I’m on an airplane on my way to Burbank California to be interviewed on Deborah Dachinger’s “Dare to Dream” radio show. If I’m honest, I’m a bit nervous. She told me that she has up to a million listeners between the different stations and places the interview will be aired. I know that the interview will go well. I’ve been on many, and none has ever been a problem. But this time it feels very important, like someone who really needs to read my book will hear. Or that someone who may be able to get the word out about the book will tune in. When I get nervous I start to feel alone, like I’m the only one in the world who cares about what I’m doing. And in those times, always, Mark peeks in. And this time is no different. He is smiling. I have a feeling this interview will be different. Most shows I’ve been on have either been sympathetic yet curious about my story, or they have enjoyed ribbing me about talking with my dead husband. Each one has been perfect. 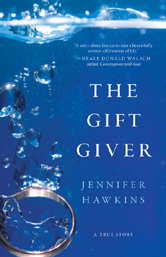 I want “The Gift Giver” to be a New York Times bestseller. And I want it to be made into a movie. The revelations and messages in it about life and death are profound. They are life-changing. As Neale Donald Walsh said, “A story about loss turns into a beautiful affirmation of life”. He’s right, anyone, whether or not they have lost someone close to them will find beauty, joy and peace in this story. If you get a chance please tune in to my interview with Deborah Dachinger. It will air multiple times in the Los Angeles area on KYHY and on another syndicated station in Vermont and New York. You can go to www.deborahdachinger.com for times. I hope you share the gift of this story with one’s you love.